Recalling himself as a boy enjoying a family activity that appealed to his nature and all his senses Heaney show-cases his talent for transposing close observation into words. From late summer blackberries would grow in profusion around the family home at Mossbawn. Every year optimum growing conditions of moisture and warmth (heavy rain and sun) would guarantee a crop of blackberries. Reference to summer’s blood ensures the idea of a ‘living’ fruit. Each bramble would carry blackberries at different stage of maturity and edibility: red, green, hard as a knot. The front-runner (just one, a glossy purple clot) savoured for its flesh…sweet/ Like thickened wine was sufficient to whet the desire to savour (lust or picking). As increasing numbers ripened so their colouring would indicate maturity (the red ones inked up). Once sharpened the family’s hunger sent them forth around the farm bearing whatever containers they could lay hands on. Pitfalls (briars scratched and wet grass bleached our boots) did not get in the way of their painstaking mission (We trekked and picked until the cans were full). Containers were filled with hard unripe blackberries that resounded Until the tinkling bottom had been covered overlaid with ripe ones (big dark blobs) that seemed to answer his gaze: burned/ Like a plate of eyes. Their hands stung (peppered/ With thorn pricks) and palms were juice-stained: sticky as Bluebeard’s (a fairy-tale about a man with human blood on his hands). The fruit was a stored treasure, hoarded in byre … bath … secret cache where its desperately fleeting freshness was quickly invaded by a fur/ A rat-grey fungus that fed voraciously on it like revolting rodents glutting and producing a nasty smell. Late August, heavy rain and sun … he now acknowledges the childish irony: Each year I hoped they’d keep, knew they would not. Bluebeard from a fairy tale in Perrault’s Contes de ma Mère of 1697; a man with blood on his hands. Having murdered several wives Bluebeard was killed when about to behead the wife who had discovered evidence of his grisly past. 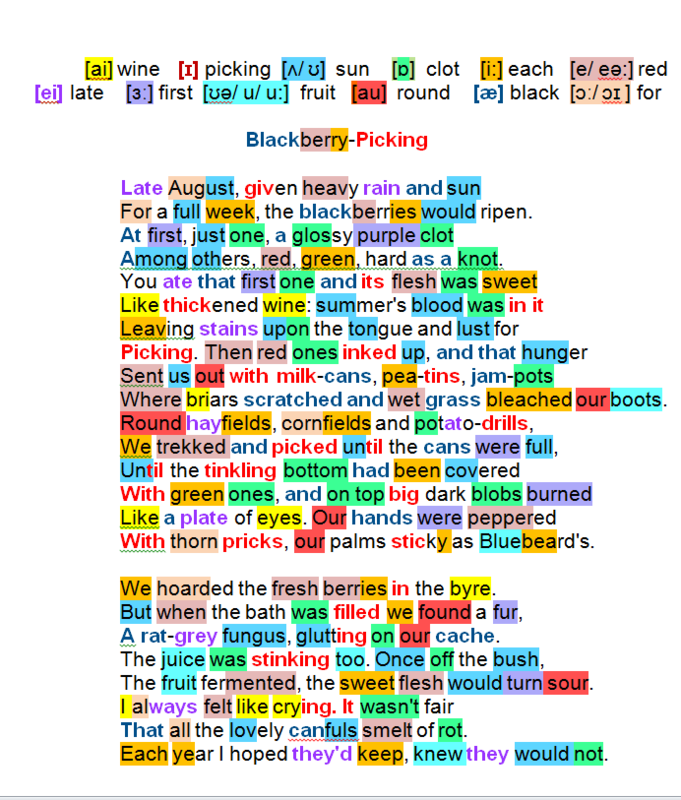 the music of the poem: twelve assonant strands are woven into the text; Heaney places them grouped within specific areas to create internal rhymes , or reprises them at intervals or threads them through the text.